Oil pastels are some of my favorites, in both my professional practice teaching art to young children well as at home with my own child.While it's tempting to stick with the oh-so-cute crafty kids' projects (I adore the too) that have your child make "something," don't forget about processed-based activities too. Don't get me wrong, I'm all for making paper mache Easter eggs, mini clay dinos, mosaic rainbows and the like. But, I also love, love, love good old "explore the process" art. 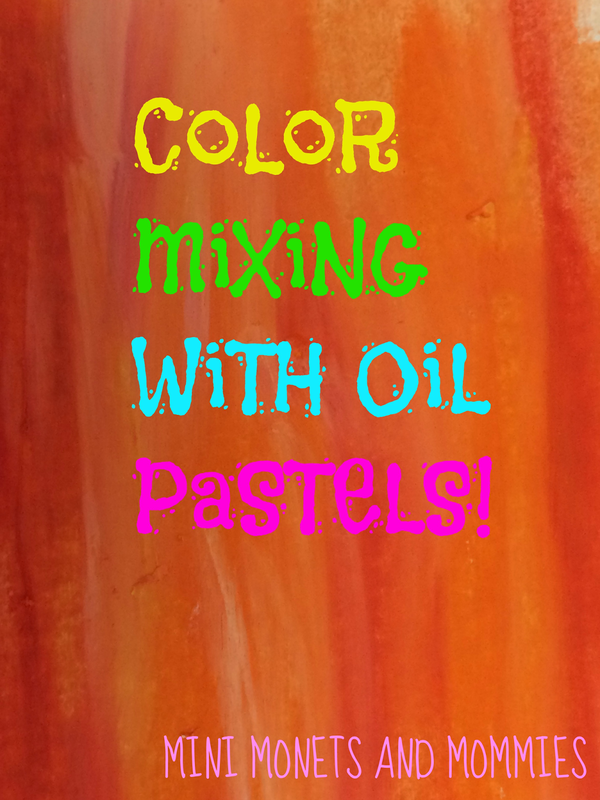 Sure, oil pastels are messier than the traditional type of crayon, but the wax ones don't smudge, smear and blend together in the same cool and creative way as oils do. Even tough oil pastels aren't the neatest of materials, they are a step above paints when it comes to the mess-factor. As a bonus, your child can use them to make straight-out drawings or to explore and experiment with while mixing colors. Cover the work surface. It will make clean up much easier. Also, don't let your child use the pastels on or above your favorite white rug. You won't ever get a smooshed red pastel out of the pristine fibers. Show your child (by modeling with your own paper, and not by taking over hers) how to blend the colors with your fingers. Swirl, drag and mix three, four or more hues together. Give her a piece of paper towel or a cloth (if you don't mind making it art-only from now on) to swirl and blend with. This will help her to pull the colors across the page and ease her into the activity. She can also use sponges, fabric scraps or even an old mitten! Get in a little "yellow + blue = green" action. Show her how to make the secondary colors (green, orange and purple) from the primaries (red, blue and yellow). Have her use the art vocabulary "primary" and "secondary." While you're doing this (or rather, before), try reading Leo Lionni's "Little Yellow and Little Blue". Let her get messy. If she accidentally smears a purple streak across her arm, let it go until she's done exploring with her oil pastels. Unwrap the pastels. Have her roll them across the paper like pint-sized rolling pins. Use craft sticks (tilted on their sides) to scratch away some of the color. Your child can create patterns and textures using this technique. Ask her to see how far she can drag the color across the paper, making it lighter as the pastel thins out. Follow Erica Loop's board Process Art for Kids on Pinterest.